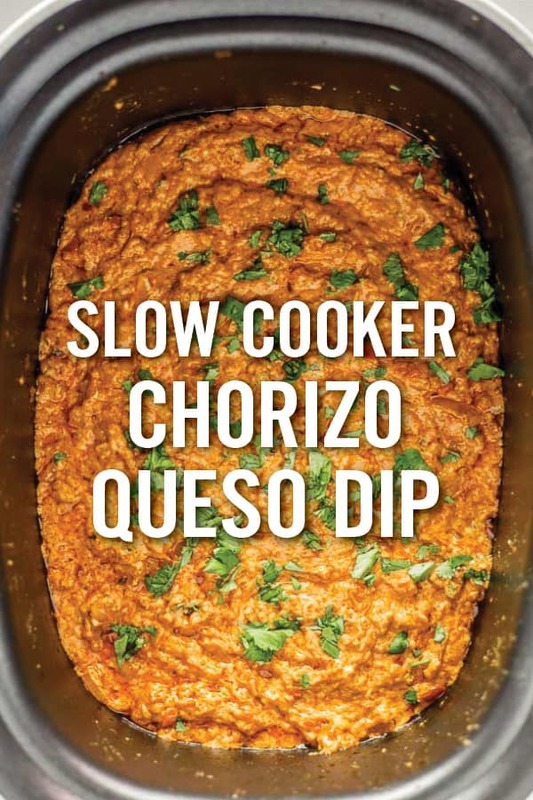 Learn how to make easy Slow Cooker Chorizo Queso Dip. Just a few ingredients mixed together to create a rich, velvety and creamy queso dip perfect for parties or a fun appetizer. This post is sponsored by La Terra Fina. All content and opinions are mine alone. What do you get when you combine fall weather and football season? 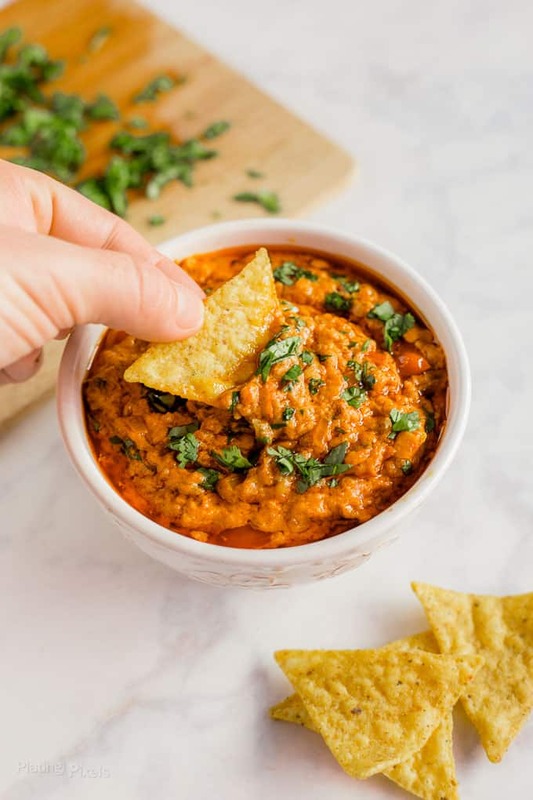 Comfort food recipes like this Slow Cooker Chorizo Queso Dip. It’s an easy combination of cooked chorizo, cream cheese mixed with jalapenos and peppers, plus shredded cheese, milk, onion and tomato. Serve warm and gooey for an easy appetizer with little hands-on time. Slow cooking makes queso super easy. 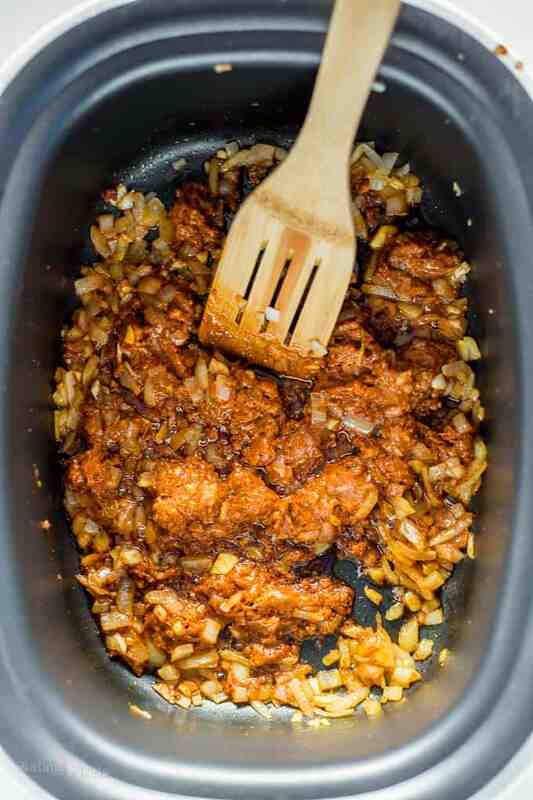 Once you cook the onion, garlic and chorizo, simply combine all ingredients, heat then serve. It’s ready in just over an hour and stays warm for a decadent party appetizer. How to make queso dip without velveeta cheese? You can make creamy queso dip without velveeta and still have a rich and creamy texture. Simply use cream cheese based La Terra Fina Dip, shredded cheese and milk for homemade queso dip. Read on to learn more about recommended cheese for queso dip. What kind of cheese is used in queso dip? Monterey jack cheese is most common, as well as cheddar cheese. I find that shredded Mexican cheese blend best to make queso. It’s a mixture of these as well as queso and asadero cheese. Plus no shredding is needed. To make this slow cooker queso dip even easier use La Terra Fina Queso Cheese Dip instead of plain cream cheese. 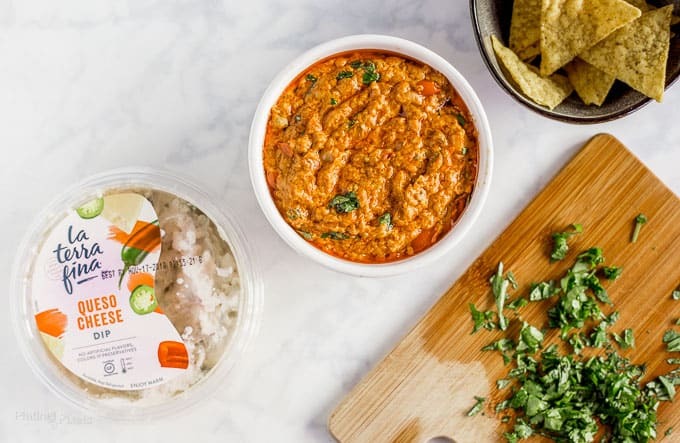 It’s a rich and creamy, cream cheese-based dip made with high quality ingredients and no artificial colors, flavors or preservatives. It’s also gluten-free and trans-fat free. 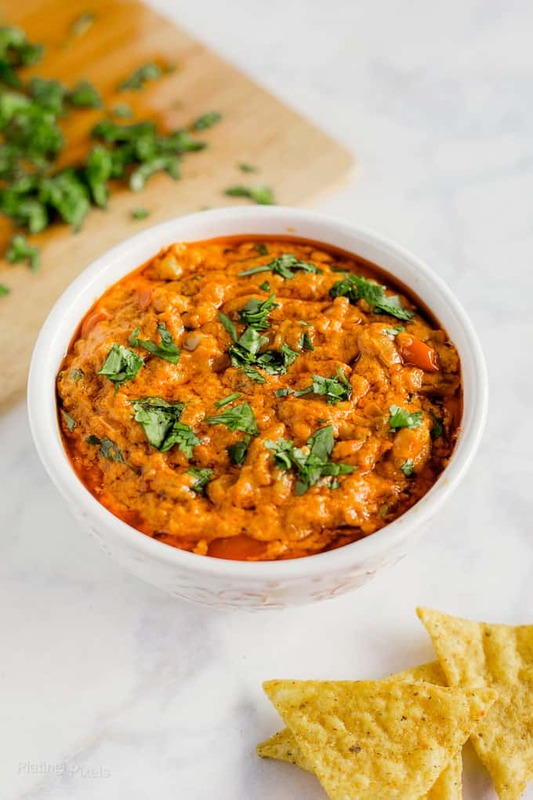 Mixed with Monterey Jack cheese, peppers and jalapenos for an all in one dip that’s tasty as is or added to this homemade slow cooker queso dip. You may be wondering how long queso dip can be left out. 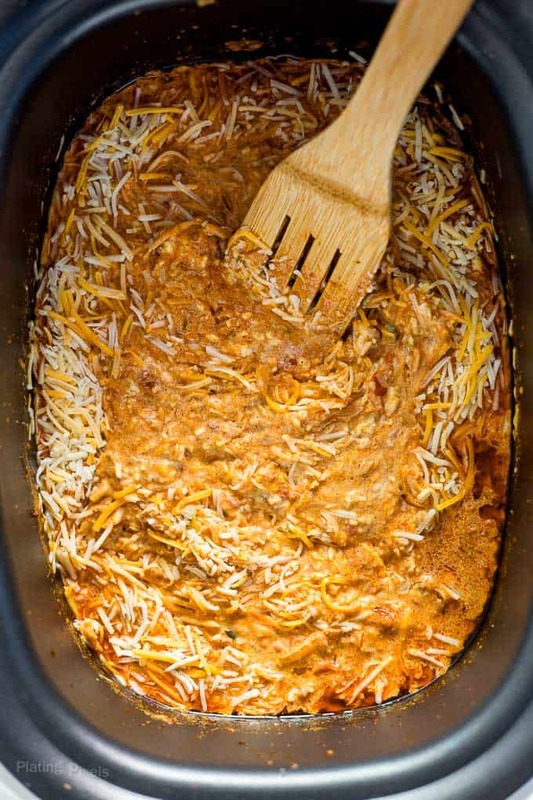 If you use a slow cooker queso dip will stay warm and safe for hours. Queso dip is best kept warm, so if not left over heat source serve immediately and consume within 10-20 minutes. Otherwise it will cool and thicken. How long can queso dip be stored? Leftover queso dip can be stored covered in fridge up to a week. How to serve leftover queso: To serve again, simply re-heat on low in slow cooker or microwave until warm. Just a few ingredients mixed together to create a rich, velvety and creamy queso dip perfect for parties or a fun appetizer. Peel and dice onion into small pieces. If slow cooker has a stove feature set to high and add oil. Otherwise heat in a non-stick pan over medium-high heat. Add onion and garlic to pan, cook 4-6 minutes until translucent and fragrant, stirring often. Add chorizo, break up meat, and cook 7-10 minutes more. If cooking on stove transfer mixture to a slow cooker. Stir in La Terra Fina Queso Dip, milk, shredded cheese, tomato and chili powder. Cook covered on LOW for 1 hour until cheese is melted. Stir again and garnish with cilantro. Keep on warm setting and serve with tortilla chips for dipping. Most queso dip recipes call for cream cheese, this recipe substitutes that with La Terra Fina Queso Dip for extra flavor. It has jalapenos, peppers and Mexican spices mixed right in. Wow this looks absolutely amazing. I love the colour and flavors. I bet this will be such a huge hit at the Holidays parties. I’m saving this recipe to try. Thanks so much Natalie and hope you have a wonderful holiday season! Looks and sounds delicious! Great to take to a Holiday Party! I want to pick this off my screen with a tortilla in my hand. Ah.. looks so good. Love melted cheese. Saving this for later. Thanks Veena, I like your enthusiasm! 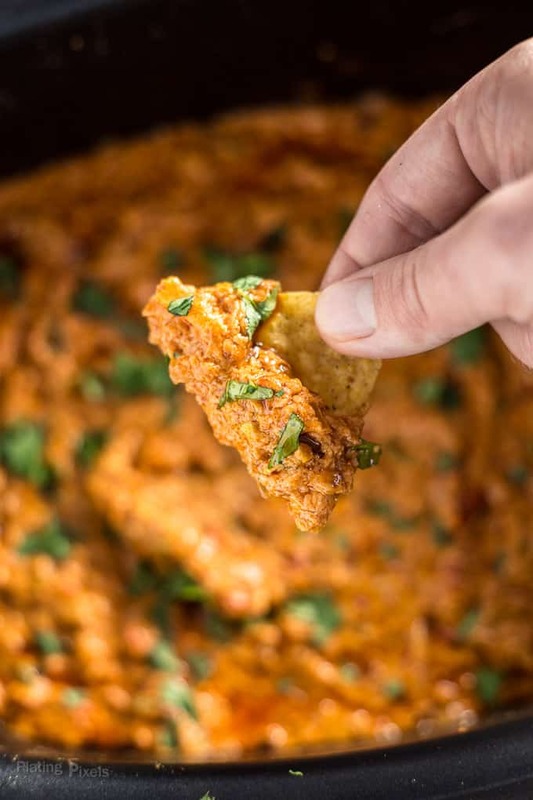 That chorizo queso dip looks amazing. I love serving dips when I have guests and am always on the look out for new dip ideas! One to try! Thanks Jacqueline and totally agree. 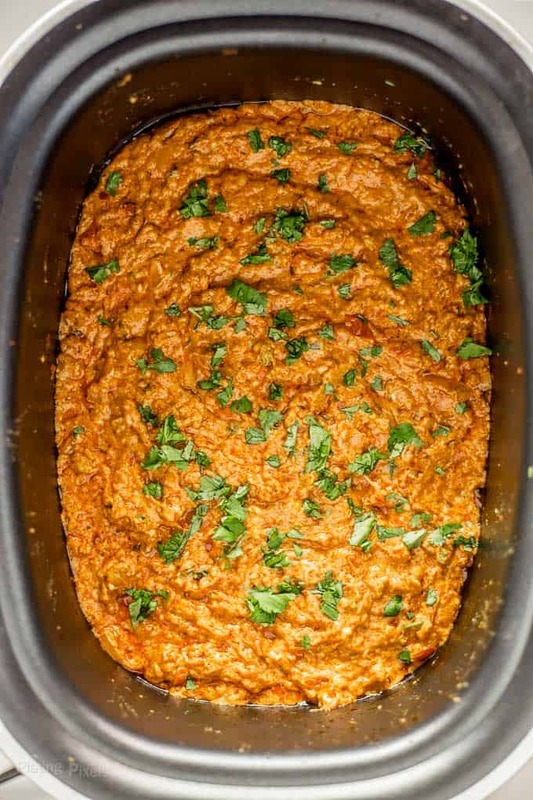 Dips are great for guests! That looks so delicious. This would be perfect to make for a holiday party.